According to Marvel Studios president Kevin Feige, the sequel to 2017's Spider-Man: Homecoming will take the webslinger/budding Avenger out of his home of Queens, NY and across the Atlantic Ocean for at least a part of his next adventure. The globetrotting detail about the Spider-Man: Homecoming sequel was first confirmed by io9, who spoke about the movie's production with Feige during the weekend before the worldwide launch of Avengers: Infinity War. During the chat, Feige shared some details about the production of the movie that will launch the fourth phase of the Marvel Cinematic Universe, including one big nugget of information that could make Peter Parker's next adventure feel very different from his first outing in the MCU. "We start filming early July," Feige said, discussing the ramp-up to production on the sequel. "We film in London. We shot the first film in Atlanta. And we shoot a lot of films in London, but there's another reason we're shooting in London which is, yes, Spidey, of course, will spend some time in New York, but he'll spend some time in other parts of the globe." This is a big change from the first go-around for Tom Holland as Spider-Man, which kept the character fairly localized around his Queens-based environs — excluding one field trip to Washington, D.C. for an Academic Decathlon competition and an action scene or two. 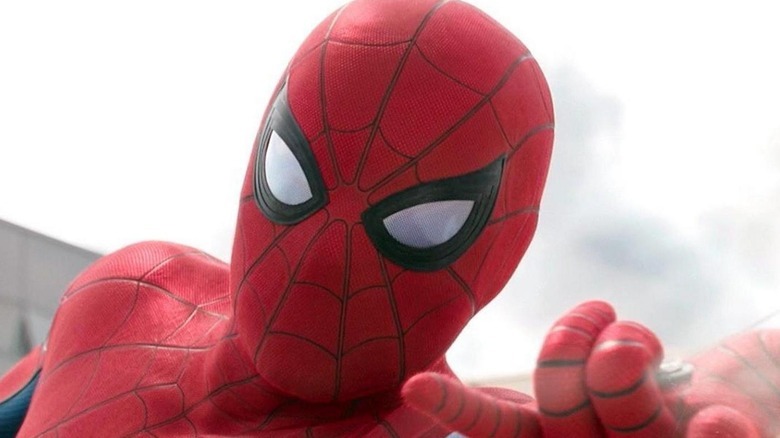 But while those scenes took Spidey six hours or so out of his home environment, the sequel will apparently up the ante by putting the teenage wall-crawler on the opposite side of the world. Further comments from Feige seem to indicate that the London-based scenes will be a natural result of Spider-Man's growth as a superhero, and will be informed by the titanic events of Infinity War and its untitled sequel. "The way Civil War and the fact that he went to Leipzig Airport and then has to go back to school informed Homecoming, the two Avengers films that precede [the sequel] will greatly inform, probably even more so, the next movie," Feige said. We already know that Peter will be upgrading to his Tony Stark-designed Iron Spider suit for a part of Avengers: Infinity War, and from the look of the trailers, he has a chance of actually leaving the planet Earth for at least one insane setpiece. From Feige's comments, it sounds like getting called up to the major leagues to fight Thanos will inform Peter's approach in his next solo adventure. How it will happen, exactly, we're not quite sure of yet. One of the biggest charms about Spider-Man: Homecoming was how lived-in and authentic the world of Marvel's Queens felt, showcasing a diverse and eclectic cast of New York City characters who all seemed like they came from the real place. That street-level heroism is a huge part of Spider-Man's appeal, especially compared to the more powerful, universe-spanning heroes in the MCU like Thor or the Guardians of the Galaxy. Hopefully Tom Holland and the creative team behind the next movie can keep that sense of community baked into the franchise as Spider-Man picks up a passport and goes global. Who knows — maybe in the lead-up, he can swing by San Francisco to check in on Tom Hardy's Venom. Whether he shows up in Sony's Venom spin-off or not, Spider-Man will stay plenty busy in the lead-up to his second movie. We already know he plays a major part in the cast of Avengers: Infinity War, which premieres worldwide on April 27. He's also expected to be a part of the following Avengers movie, set for release on May 3, 2019, after which he'll officially kick off MCU Phase Four with the Homecoming sequel on July 5, 2019.